After studying in Canada and Taiwan 32 Global Business students of the ACT program started their term at the JKU on February 11th. For the coming ten weeks they will mainly work on company projects together with companies like Rosenbauer, Pöttinger, Business Upper Austria, voestalpine, KPMG, Fronius and Rübig. 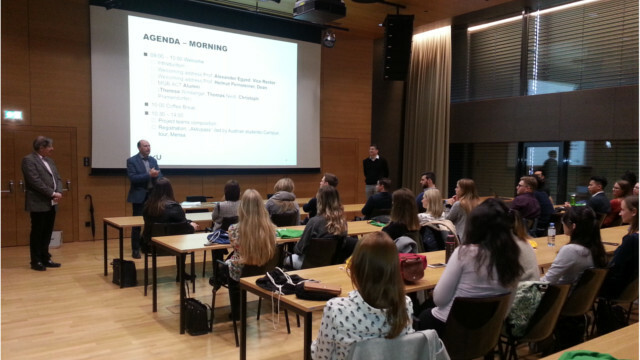 The international students coming from Europe, Asia and North America were warmly welcomed by Prof. Egyed, Vice Rector for Research and Prof. Pernsteiner, Dean of the Faculty of Social Sciences, Economics & Business. Furthermore at the kick-off event three former ACT-students talked about their experiences and further careers after finishing the ACT program sharing their impressive professional development with the ACT students: All of them meanwhile work in management positions at well-known companies.